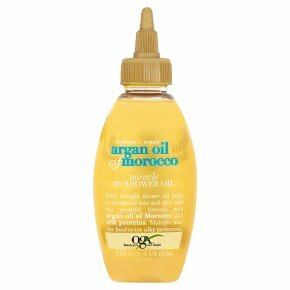 Beauty pure and simple.Extra strength shower oil helps to moisturize hair and skin with this powerful formula with argan oil of Morocco and silk proteins. Multiple uses for head-to-toe silky perfection. Direction for Use... This multi-tasking oil can be used as follows: apply to hair before shampooing; add a few drops directly to shampoo or conditioner; apply to towel dried hair and leave in; apply to skin (in or out of shower). For best result use in conjunction with other OGX products. Moisture Multiplier Add 2-3 drops to shampoo for added moisture. Skin Moisturizer Use directly on skin as a moisturizer. Damage Prevention Before shampooing, run a small amount through hair as a pre-shampoo treatment. Conditioner Boost Apply 2-3 drops to conditioner for an in-shower conditioning boost. Split Ends Mender Apply a small amount to the ends of your hair for use as a split ends mender. Warning: Surfaces may be slippery after use. Avoid contact with eyes. If contact occurs rinse immediately.